So a week ago Bellevue developer comes to this side of Lake Washington to tell us Bremerton needs retail. Silverdale doesn’t have a city hall. Bainbridge Island is still part of this county. Commenters to the story also complained about the parking, with responses that Kmart had plenty of free parking, and then arguments that downtown needs people for retail to survive. None of it is wrong, and Kemper Freeman’s point about Tacoma is perhaps worth considering. Nonetheless, does his take mean Bremerton should have put retail in first. Well then, how do you do that? I think the whole point of these parks and conference centers and tunnels and new bridges and hotels and government centers and infrastructure tax breaks and property tax breaks and road paving and condo building and Bellevue developer wooing and new marinas and fish and fisherman statues and parking committees is designed to create what? It is designed to create the kind of crowd I saw the other day at 2 Blocks Up Cafe at the corner of Pacific Avenue and Fourth Street. On Wednesday during a break in union negotiations four of us headed over to the cafe for sandwiches and strategizing and found that we had to sit outside the restaurant. The place was packed. I don’t know what accounted for the rush that day, and I don’t know if that’s a regular thing. You can’t create conclusions from a single observation, try as story commenters might. Nonetheless, what I have seen is a host of downtown merchants who are believers in downtown Bremerton. Boston’s Pizza is doing great night business now because of the Fairfield Inn. Bremerton has not turned the corner it needs to for downtown to be considered a success, but despite the economic downturn the momentum hasn’t stopped. At least, it hasn’t as far as I can tell from my casual observations. Did you remember that there are some people who want to be able to have hens in their Bremerton backyards. Here’s the latest from a purely observational standpoint. I haven’t written much about it lately, but I saw another Facebook post last week to suggest the group is gathering signatures. One note said nine sheets were turned in, which would mean the group has 180 signatures and needs only 2,320 more to get on the ballot. Meanwhile, the city council has remained silent on the issue in every meeting I have attended, and that has been quite a few. That can’t be too good a sign for those who want to decriminalize poultry in the city. 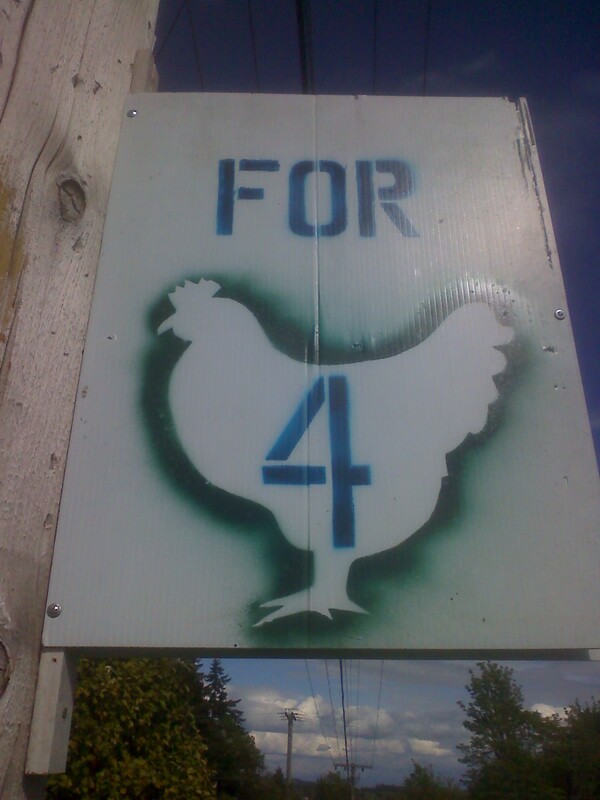 You may recall that chicken fans don’t really want to go to the ballot box to get their hens, but they’re willing. This weekend they’ll travel to Port Orchard to gather signatures from Bremerton registered voters disloyally shopping across the inlet. They also have plans to hold more signature-gathering meetings to get petitions out at outdoor markets and other events. Thursday afternoon I spotted the sign posted here, took a picture, then drove all over much of the rest of town to see if I could find even one more sign like it. I didn’t find one. A co-worker plying his trade on a Saturday decided to take a break in the place that is one of the breakiest of the break places in downtown Bremerton, the Harborside Fountain Park. The park, besides its whale spouts and imported trees and rocks, has a sound system that when employed provides an atmospheric backdrop that says, well I’m not sure what it says. It just plays music. Said co-worker happened to be there on a day when said music was the kind that contains several references to human intimacy in rather non-discreet language, applying a common term that generally refers to intimacy to things that are incapable of being intimate, such as cars, homes and accountants. If you still don’t know what I’m talking about, think of Ralphie when the lugnuts flew, and not because someone shot them. Said co-worker told me of said incident, when diaper-clad kids could splash to the sounds of a story about women who are not particularly choosy and tend to display improper manners. It caused me to make three trips to the fountain park. When I went, though, all I heard was music inoffensive, unless you count Billy Squire. (I do, but not for the same reasons.) The broadcast was from the Sirius satellite network, which doesn’t have to concern itself with Federal Communications Commission standards. If Janet Jackson had experienced that malfunction on the Sirius radio, if that were possible, she wouldn’t have been fined. I talked to Wyn Birkenthal, Bremerton’s parks and recreation director, about the Saturday experience of my co-worker and he was appropriately aghast. It’s not something he wanted repeated. Staff has been instructed to only employ channels that “provide music without profane lyrics or questionable DJ commentary. You’re children are safe from potty mouth entertainers, at least in Bremerton‘s parks. I can’t protect them from bad musicians, though. It made me long for the old days, when a sign like that would inspire me to stop and take a picture to throw up on a blog, an excuse to get silly about Port Orchard. The pressures of writing for two blogs, though, eventually became too much, though. I passed by that place taking no pictures and writing no screed against your fair city. It’s like those dogs in that Gary Larson cartoon. They’re sitting on the porch while a cat’s delivering mail, while the dogs do nothing. “We’re getting old, Jake,” one says to the other. That could change in the next few weeks. As Chris has likely explained to you, my illiterate rants (as opposed to the brilliant ones I write on the Kitsap Caucus site) can again find a home. I’ll just post them here. The Bremerton Beat is no more. See it as a victory if you like, but I’d be careful. Here in Bremerton we like our chickens illegal and our hot dog vendors spread out a bit. We’re a different breed, and we can see your houses from our condos. We can draw tourists with whimsy and fountains. Pretty soon we’re going to have something else to draw them, and that includes you. While our finest residents will be going to your town to post bail, your finest will coming to ours for something else. I can’t yet tell you yet what it is. Remember though, you’re on notice. Fans of Uptown Mike’s hot dog stand – formerly located on the Bremerton Boardwalk — take note. Mike Lipson, a.k.a. Uptown Mike, has relocated his business to Port Orchard, specifically the front terrace of the Kitsap County Administration Building at 619 Division Street. Hot dogs and government? Well you know what they say about making sausage. Apparently Kitsap legislators have a greater appetite for hot dogs than Bremerton boaters. “There was not enough traffic there to support the business,” said Lipson, explaining his move from the boardwalk. Lipson, a Port Orchard resident five years and counting, formerly operated his stand on the Port Orchard waterfront and added the Bremerton location about two years ago. Now, he’s open at the courthouse 10 a.m. to 3 p.m. Monday through Wednesday and at Ace Hardware in Port Orchard’s Towne Center Mall Thursday through Sunday. Getting a hot dog at Uptown Mike’s is as much about the experience as it is the food. Lipson, born in Brooklyn, raised in Queens, slathers on the accent – only slightly diluted by 30 years away from the Big Apple – like an extra serving of grilled onions. He sings the praises of his product with characteristic NYC hyperbole. “You go from baby food to hot dogs. It’s on every street corner,” he said. Lipson serves genuine Sabrett frankfurters, “the official hot dog of New York City.” That may not mean much to the general public. But to former New Yorkers like Steve Krecker, it’s the gold standard. 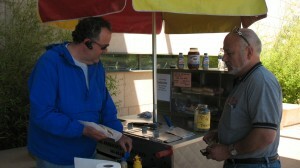 “Sabrett hot dogs, as far as I’m concerned, are the best hot dogs on the planet. 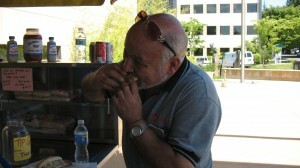 It’s nice to be able to get them,” said Krecker, his own accent thickening with every bite. Krecker has dogged Updown Mike from one location to another. 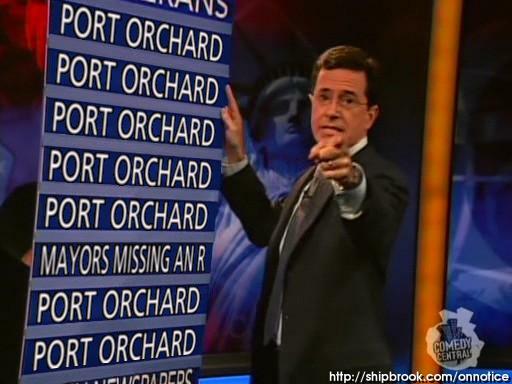 “Steve’s one of the anchors of the business. He grew up back east. He knows the food,” said Lipson. OK, so what’s the big deal about Sabrett? As someone who also grew up back east, I can say from experience, there are hot dogs and then there’s Sabrett. As I remember them, “real” New York hot dogs are plump but not spongy, with a slightly crunchy skin. Smother them with sauerkraut or tangy grilled onions in red sauce, inhale the spicy aroma (mixed with the damp cellar smell wafting out of the subway) and chomp down. Ahhh. Theoretically all that would be missing here is the subway. Alas, when I arrived for my meeting with the county commissioners this week, I had just eaten lunch, so I have yet to find out if Uptown Mike’s lives up to my memories. 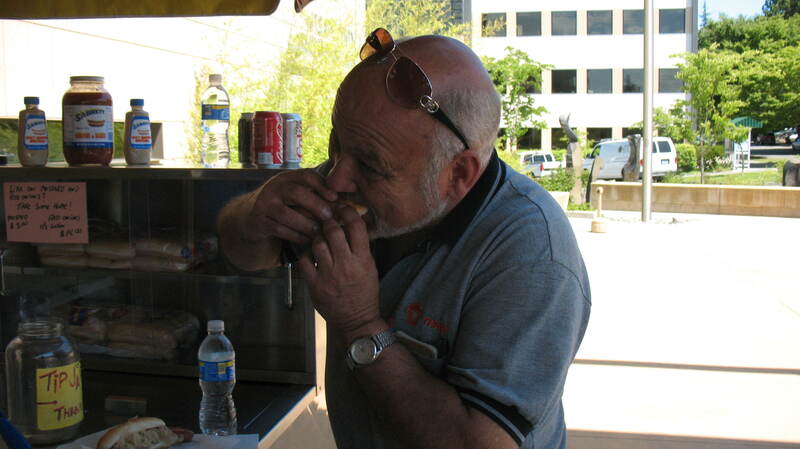 Bremerton Beat blogger Steve Gardner, who sampled Lipson’s wares in 2007 in Port Orchard, declined to pick a favorite out of Uptown’s — then planning to locate in Bremerton — and two other Bremerton hot dog stands. Gardner recently drove out of his way to see what Snap Dogs Diner, open this year on Lund Avenue in Port Orchard, had to offer. Gardner’s obviously never met a dog he didn’t like. So, Steve (and Bremerton) eat your heart out. At least you’ll have a good reason to look forward to those commissioners’ meetings.